82513 WY: This is the life! Living in Dubois: What Could Be Sweeter? Mostly Dubois WY rests in splendid isolation, 80 miles from anywhere. Once in a while it basks briefly, if uncomfortably, in the bright light of publicity. 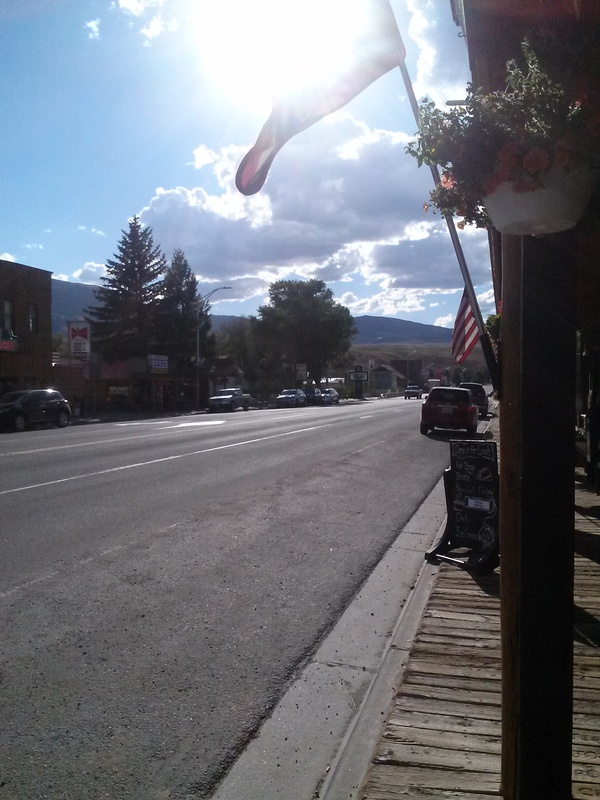 Mostly, Dubois WY rests in its splendid isolation, 80 miles from anywhere else. But once in a while it basks briefly, and a bit uncomfortably, in the bright light of the national media. Six years ago, Kevin Bacon starred in Taking Chance, a movie (not actually filmed here, curiously) that honored the town’s welcome home to the body of a son fallen in Iraq. Late last December, the fire that engulfed part of the historic main street, and the heroic response of volunteer firefighters, made a great story for the post-Christmas news slump on NBC. 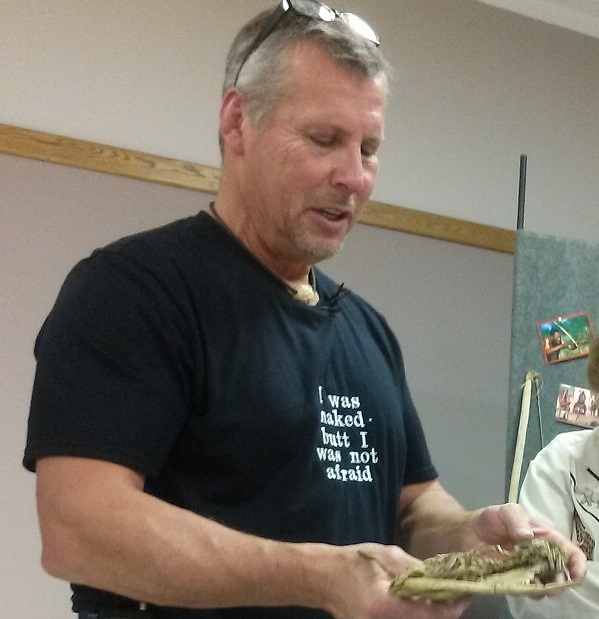 Joe Brandl shows off a shoe he made from bulrushes. They were great until they got wet. And last night, one of our favorite local characters won his 50 minutes of fame on the Discovery Channel series “Naked and Afraid.” I went to a celebration at the Headwaters, with some 200 townsfolk, to watch the broadcast on a big screen and to celebrate as our local tanner and Boy Scout leader, Joe Brandl, described his 21-day adventure on a remote island in Namibia. He was surrounded by swamps, armed with nothing more than his tin cook-pot and knife, and assisted by a previously unknown female companion who had brought along a fire-starter. We all knew right away that they wouldn’t need the fire-starter. Joe has published a multi-part series in the local weekly newspaper about how to survive in the wilderness, including advice on how to create a survival kit that would fit inside a Band-Aid tin. He also wrote about how he survived a winter breakdown miles into the middle of nowhere by using his underwear and gasoline from the tank to start a fire. He compiled all this in the first place to educate his young Scouts, who spend lots of time out in the wilderness for their own amusement. Long since, like many others here, Joe has learned to start fires the original way (as another castaway, Tom Hanks, showed us in a different movie), by spinning a stick rammed into some fragile kindling. 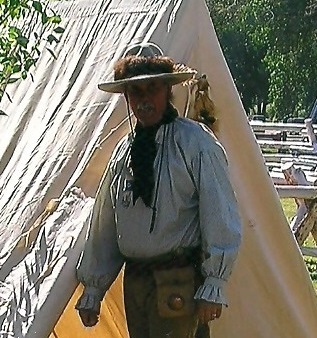 Steve Banks in mountain man regalia. Joe said he was fascinated by mountain men from an early age. “I tried not to just read it, but to live it,” he told us. The guy operating the sound system last night lives by exactly the same motto. A retired telecommunications engineer and amateur local historian, Steve Banks has not only studied the journals of mountain men like John Colter, he has made a pastime of walking every step they walked and seeing the very vistas they described. Banks knows the trails of the Yellowstone Basin better than I know the back of my own hand. Probably nobody in the room would have doubted that Joe Brandl would make it through his 21 days in isolation not only unscathed, but triumphant. (It was a set-up anyway, of course. The camera crew was ever-present, and medics checked the pair every day.) Nonetheless, we listened fascinated as he described finding nothing to eat for the first 12 days but grubs, minnows, chameleons, and one dove egg. We were silent later, as we watched our 55-year-old tough-guy neighbor on the screen, by then himself grizzled and filthy, staring with a deeply furrowed brow and moist eyes at the tiny woman young enough to be his daughter. She had broken down when sharing the experience during her job as a beat cop that had broken her heart. After vowing not to touch her without her consent, Joe reached out and gently stroked her arm. We had seen the words “Dubois WY” exposed, so briefly and so rarely, to the entire vast continent. Everyone saw them there, proudly tattooed in pixels over Joe’s living embodiment of our “brand”: Tough as nails, in many ways remote, yet deeply compassionate when someone is in trouble. The simile goes beyond even that. Like Joe himself on that virtual reality show, we people of Dubois are fundamentally concerned about our town’s survival, and always intent on assuring it — but at the same time uneasy about getting too much visibility. Did you notice that all three of my examples of national media attention have told very positive stories? Enough said. Want to read more about living in Dubois? Sign up for email updates using the link at the top of the right column. Beautiful article. I know of another Dubois claim to fame not mentioned…the stop over of the Amazing Race at the Turtle Ranch 2 yrs ago! I’m sure there are several other events that have taken place at the Turtle ranch…another low key & very modest business in Dubois. Thanks for the interesting reads. You’re so right, Sandy. The Turtle Ranch is one of many, many interesting features of Dubois that I still need to investigate and discover (although I know about it by reputation, of course). That’s the great thing about this place–so much reveals itself, as time goes on. Thanks for the suggestion (and thanks also for subscribing). Amazon CEO: Dropped NYC? Date Dubois! Living Dubois Blog at WordPress.com.